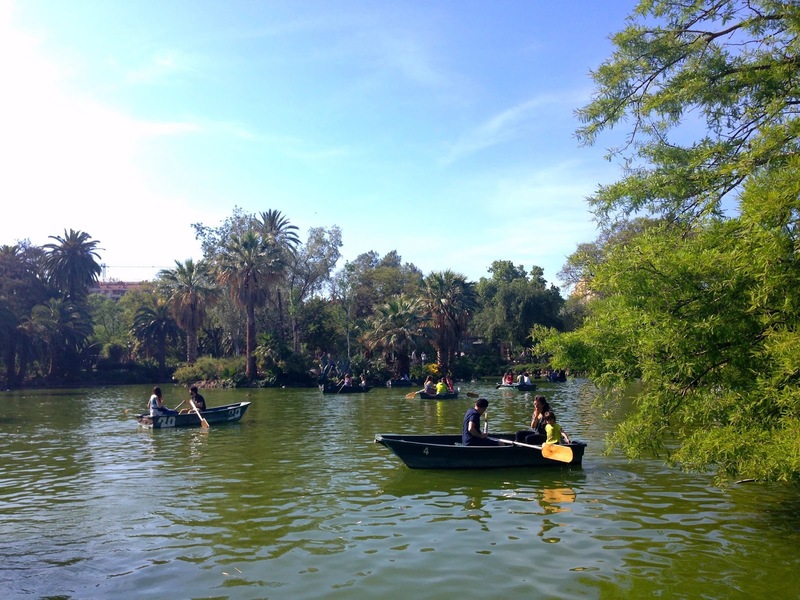 We had planned our week to accommodate spending each morning and/or afternoon in different parts of Barcelona. The subway system was reliable and easy to navigate, having a stop at every attraction we wanted to visit and plenty of intersection points to allow for more direct routes. As an added bonus, it only costs 1 euro per trip when you buy a 10-trip pass. The only downside was that the subway trains didn’t run past 12am from Sunday to Thursday, in which case taking a cab was a good (and still affordable) option. We used the subway to travel far distances and made an effort to walk everywhere else. There was no holding back in the food department on this trip, so getting some decent daily exercise was key. Walking was also a great way to discover cute shops and authentic restaurants since we didn’t have much time to do research before we left. Unique buildings designed by Antoni Gaudi are scattered around all parts of the city and feature colourful mosaic tiles and distinct curvy shapes. 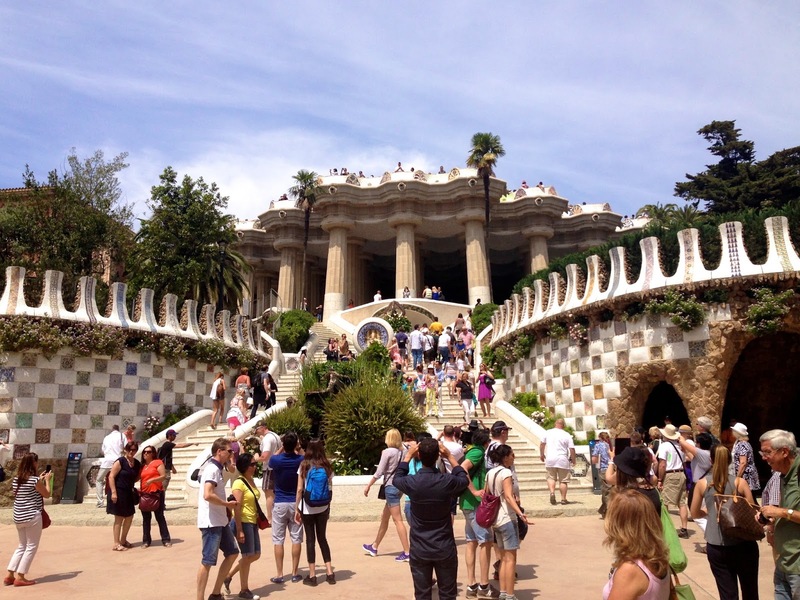 We took our time admiring the facades of Casa Mila, Casa Batllo and the Parc Güell complex and opted out of waiting in long lines to go inside the buildings. 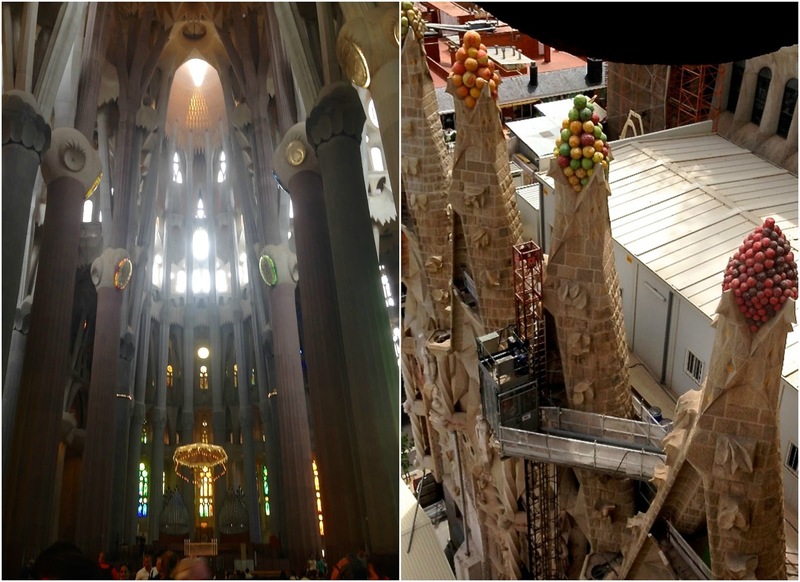 Gaudi’s famous Sagrada Famiglia, however, was a different story. Along with hundreds of other tourists and student groups, we roamed around the interior and exterior of the huge basilica (unfortunately still under construction) gawking at the incredible height of the tree-like pillars, the colourful light streaming through stained glass windows and the serene simplicity of the altar. We especially appreciated the short film playing in a small corner, which explained Gaudi’s life and the significance of the building. We opted to pay a bit extra when we purchased the tickets online so that they included an elevator ride up to the top of one of the towers. The view as we walked down was incredible, and the small windows allowed for an up-close look at the intricate mosaic details on the front of the basilica. 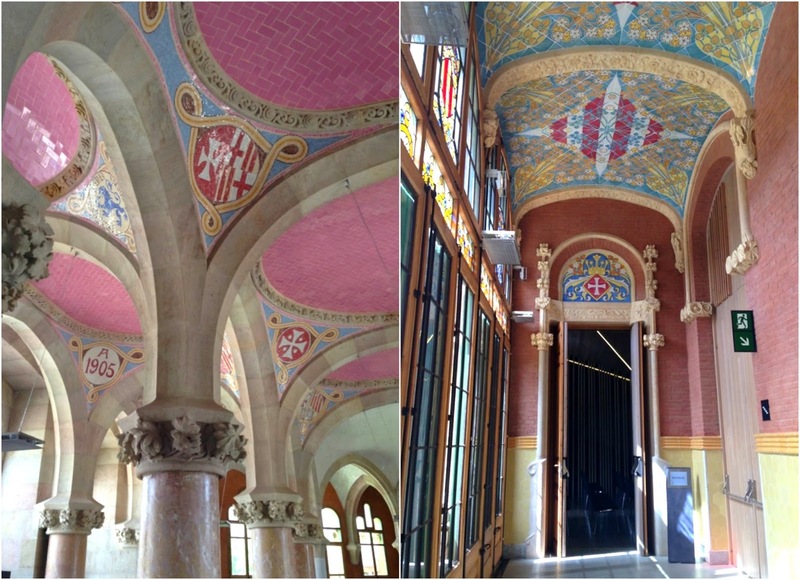 While the Gaudi buildings are a must-see in Barcelona, my favourite spots have to be The Palau de la Musica Catalana and the Hospital de la Santa Creu I Sant Pau, designed by Lluis Domenech i Montaner (another Catalan modernist architect). Both buildings were declared UNESCO World Heritage Sites in 1997. We were pleasantly surprised when we stumbled upon the beautiful Palau de la Musica Catalana on somewhat of a side street, and were excited that we could go back at night to watch a flamenco show and walk around the interior. Unfortunately, we had just missed the Grand Gala Flamenco show for that week and, once again, were left to enjoy the building from the outside. Nonetheless, we were still able to take in an incredible flamenco and opera show at the nearby (but much less elaborate) Teatre Poliorama. 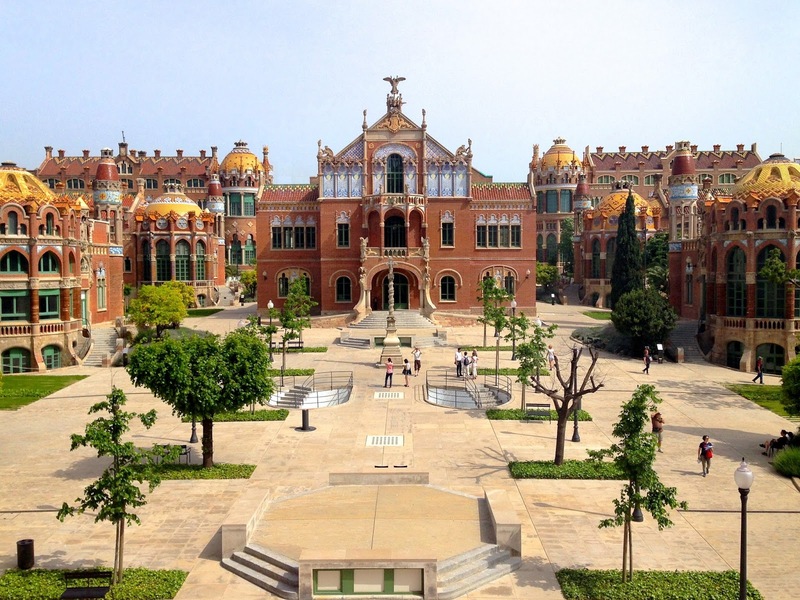 The Hospital de la Santa Creu I Sant Pau was conveniently located just down the street from our hotel and a short walk from the Sagrada Famiglia. It was a fully functioning hospital until 2009 and was recently reopened to the public as an Art Nouveau Site after a few years of restoration. I literally could have spent the entire day there. Everything was in pristine condition – from the colourful roofs and sculptures on the 12 pavillions to their antiseptic tiled interiors to the perfectly manicured orange trees and lavender bushes out front, each view was better than the last. There were one or two tour groups visiting at the same time as us, but this site is definitely one of the less popular tourist attractions in Barcelona (for now). A self-guided tour cost 8 euros (less for young adults, 16-29 years) and allowed for a peaceful stroll through the underground tunnels, gardens, a few pavilions and of course, the gift shop. I often struggle with the deciding whether to pay extra for a guided tour, be it a live tour guide or an audio guide. Since I have always been on a student budget, the decision is usually “no thanks!” and it proved to be a good choice throughout this trip since all the major tourist attractions included English descriptions as you walked through. I would, however, recommend paying for an audio guide when going through a large museum or gallery if you have a great interest in the history of the pieces on display. Although there were seemingly endless gardens, squares and side streets to admire, we appreciated taking some time to rest and refuel on the beach. The sand was clean, the water was cool, and there were several people selling drinks, large scarves, and even massage and hair braiding services as they weaved through sunbathers. Our first visit was on a Sunday and we were welcomed by a wonderful selection of artisanal food stalls along the boardwalk. They featured some of the most delicious looking pastries, quiches, pizzas, and cheeses that I’ve seen in a long time. Combined with the authentic street musicians nearby, it truly sounded, smelled and tasted like Spain. On another visit later in the week, we accidentally ended up at what seemed to be the clothing-optional section of the beach. While this wasn’t quite what we were looking for, it was nice to have a little more peace and quiet without the sales people roaming around. When it comes to eating habits, I tend to be more of a meat and potatoes kind of gal so I can’t exactly comment on Barcelona’s seemingly exquisite seafood scene. However, I was on a mission to figure out what “authentic Spanish tapas” actually are like, and I enjoyed some delicious two-bite meat/egg/pepper/potato/mushroom/bread creations along the way. Menus often included dishes with Iberian ham, chorizo sausage or squid, and various fried side options like croquettes and artichokes. We couldn’t leave without trying paella and made an impromptu trip to a restaurant (Puratapa) on Las Ramblas, the main promenade. After waiting over an hour for our meal, the giant skillet of lightly seasoned rice, chopped up chicken and a few pieces of lemon was quite underwhelming. 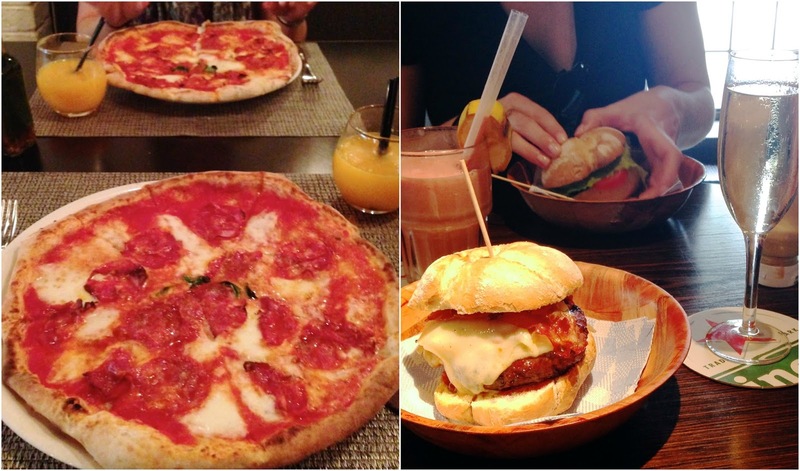 It’s definitely worthwhile to research smaller restaurants located off the main streets to get the best local dishes. Using the Trip Advisor website and looking for their sticker in the front windows of restaurants really helped us find some great places to eat over the rest of our trip, such as Restaurante Margherita and Makamaka Beach Bar, pictured above. At all the restaurants we visited, a bottle of water cost about the same as wine, pop or beer. We made sure to bring refillable bottles of water as we walked around all day, and had some more adventurous drinks with our meals including amazing freshly squeezed orange juice, Spanish “Cava” (a sparkling white wine), and sangria. One of the bars we visited in the evening, Espit Chupitos, was especially fun since it offered a list of 600+ shots at 1 euro each on Mondays. A favourite was “The Boyscout” which involved lighting part of the bar on fire, roasting a small marshmallow over the flames, extinguishing it in your shot, and drinking the shot with the marshmallow. The bartenders were great and the drink possibilities were endless with plenty of flames, candy and quirky props to go around. 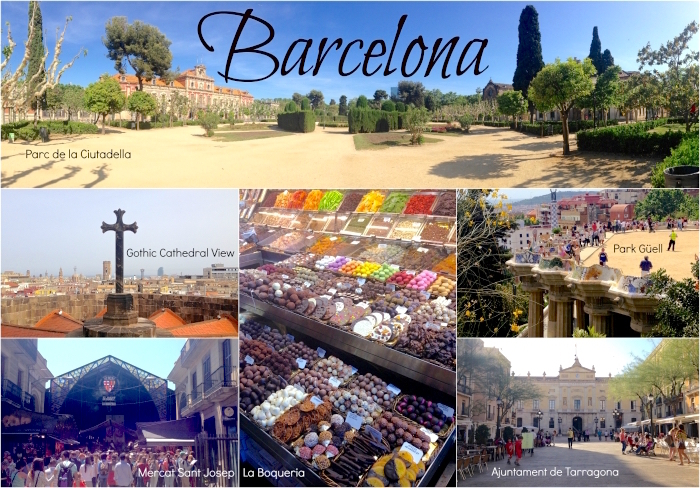 Over five days we had seen the main sights of Barcelona and decided to spend our last day in a neighbouring city. 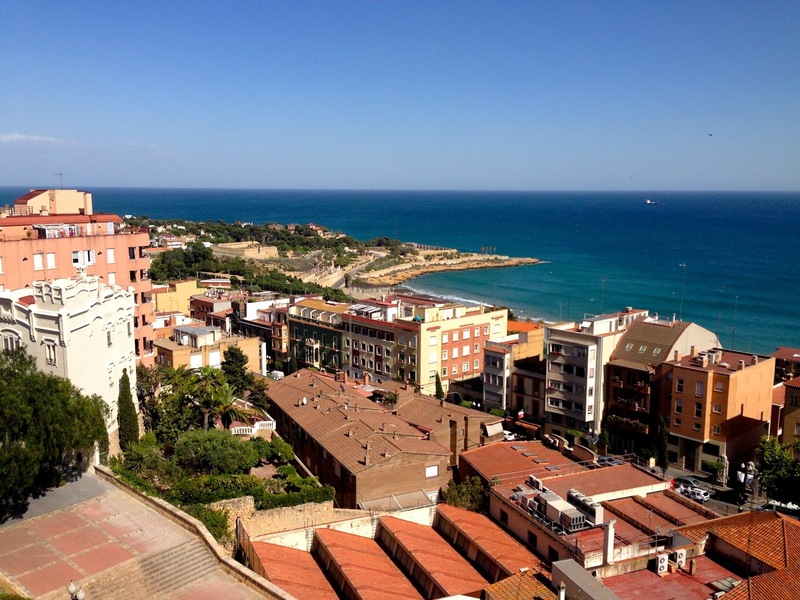 We took a train to Tarragona, which is about one hour away. What a great choice! As per usual, the view was incredible - deep turquoise water, flowering cacti, palm trees, cobblestone roads and terracotta roofs – but the highlight was the abundance of ancient Roman ruins, part of another UNESCO World Heritage Site. We freely roamed through the large 2nd century amphitheater, the circus where chariot races were held and the museum with sculptures and other artifacts. We also walked around the perimeter of the Roman walls whose construction was explained in a series of plaques along the way. 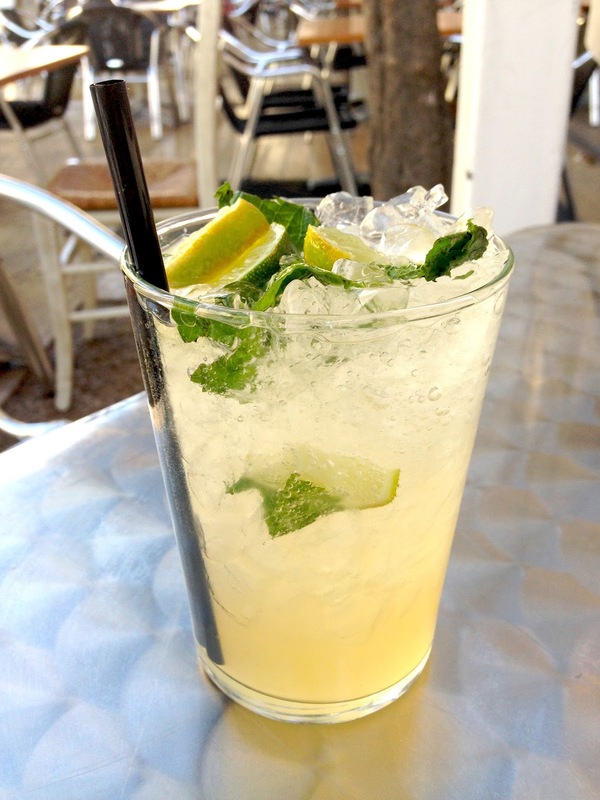 The only down side to the day was waiting two long hours for restaurants to start serving dinner at 7pm, but this was nothing that couldn’t be solved by a refreshing mojito in the sunny town square. A week in Barcelona was the perfect way to start our trip. Travelling during the second week of May meant comfortable Spring temperatures around 20-25 degrees Celsius, paired with not too many tourists. The friendly locals, excellent transit system and proximity to other popular cities made it a pleasure to tour around, and despite many warnings about pesky pickpockets, we always felt safe. 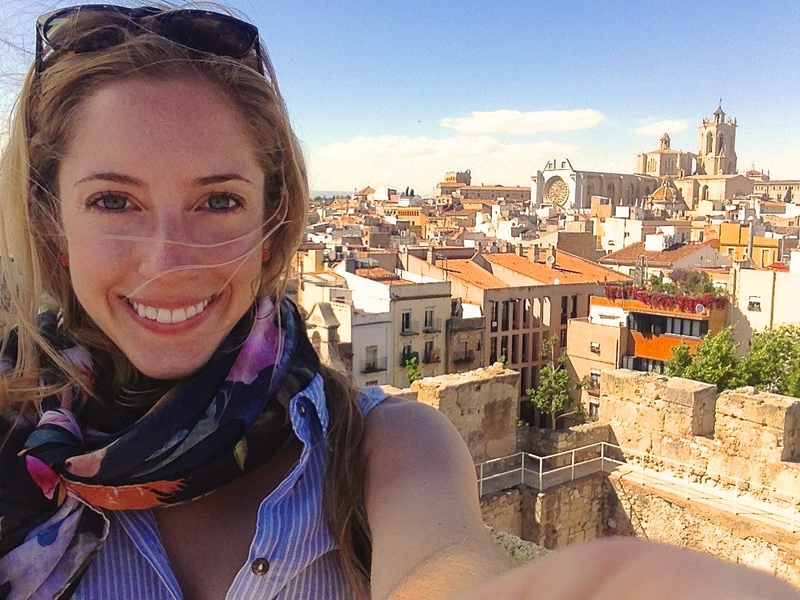 I can’t wait to explore more of Spain in the future.